My little sisters have enjoyed raiding my craft supplies for as long as I can remember (see above). :) Because they share my love of crafting, I willingly pack up boxes of supplies when I am going to visit them, no matter how cumbersome those boxes may be. I once filled one whole suitcase with craft stuff when I was flying from Texas to North Carolina for a visit. For this past trip, my luggage was about 90% craft supplies and 10% other necessary stuff. I should have taken a picture of the trunk space of our minivan--you would have to see it to believe it. I go to all this trouble because I love to use my stuff no matter where I am, and because I especially love to use it with people who appreciate it as much as I do. I am so glad my sisters share my love of crafting and, more recently, letter writing and keeping in touch. After the boys were in bed Sunday night, my sisters and their friends helped me bring my boxes upstairs to the dining room table, where we spread everything out and crafted for a few hours. My typewriter was a big hit that night. My daughter Caroline took a turn on it while Libby's friends watched with interest. They actually oooohed the first time a key hit the paper. It was pretty funny. 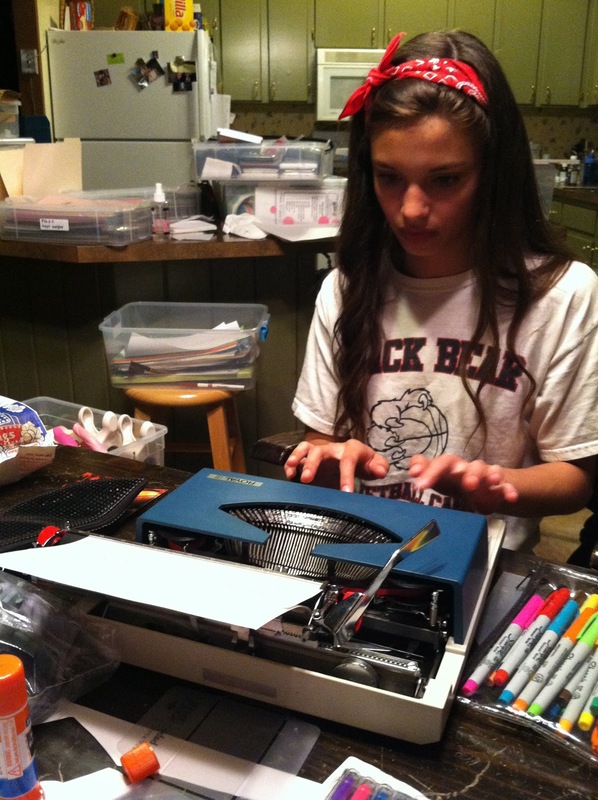 I don't know if the teenagers present had ever seen a typewriter in person before (or at least in action). 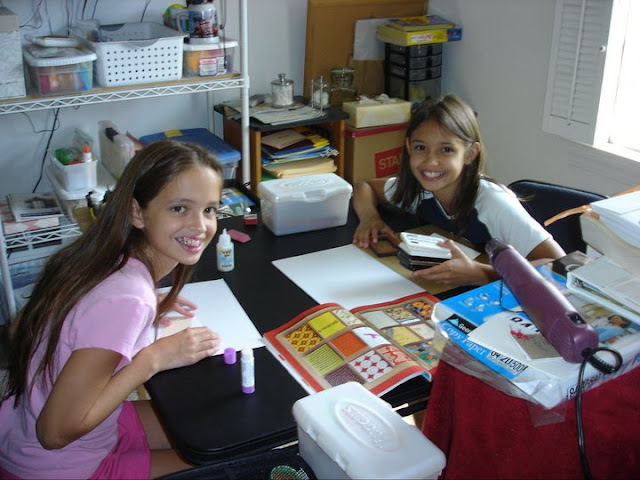 I am 17 years older than my youngest sister Libby (and her friends), but I still forget how different her childhood has been than mine in many ways. I used a typewriter (electric) in grade school for typing class. I met friends at summer camp and wrote them letters afterwards (no texts!). I only started using email my senior year of high school . . . It makes me feel old, in a way, but I also feel privileged to have lived before instantaneous communication was the norm. I appreciate the conveniences of texting and emailing (usually), but I am also glad to know firsthand the pleasures of letter writing and finding good mail in the mailbox. It makes me happy to see my young sisters starting to appreciate this too. A few years ago, when I finally got my sister Addy (now 18) into letter writing, she told me, "You were right! This is so much fun!" And now Libby is completely sold on it as well. When Libby first started typing Sunday night, she couldn't stop grinning and she kind of shuddered a little with excitement. That was my exact reaction the first time I used it. I was glad she could relate. Here she is in all seriousness working on a journal entry. Monday night we decided to do it all again. Once our dinnertime cookout was over and the littles were in bed, my dad reminded us that it was craft time (it cracked me up that he was instigating it). This time we even got the boys involved. My brother Dillon carved a stamp for his wife Laura Beth and Jonathan (Addy's boyfriend) made an envelope (!) and tried to upstage Libby with his calligraphy skills. 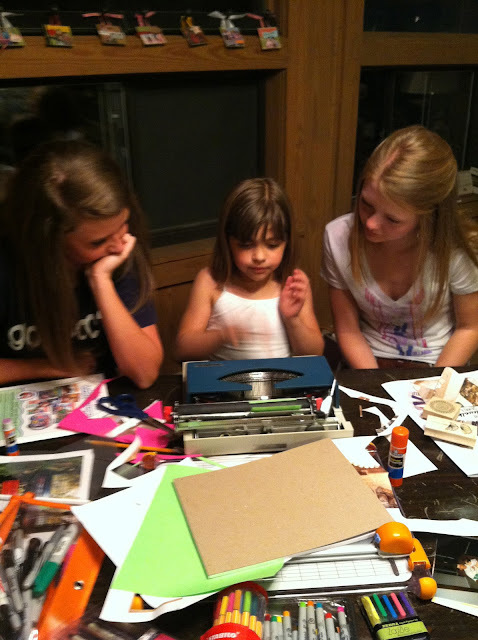 My mom took a few pictures of our family craft night. My sister Stefani didn't craft, but she stayed close by and provided running commentary. I spent a lot of my time helping others with their projects, but I did manage to get a couple of cards made. I will show you those sometime next week. I hope you have a great weekend! Thanks so much! I will have to keep my eye out for a similar frame--I love what you did with yours!